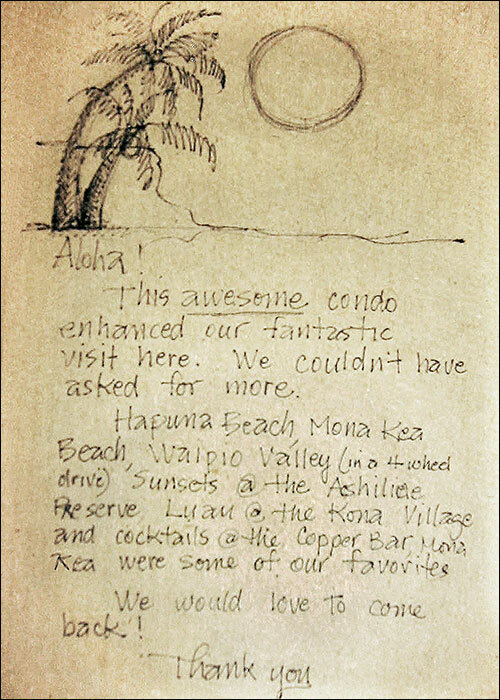 Hale Wailele in the heart of the Colony Villas is named for its beautiful view of the lava rock waterfall. 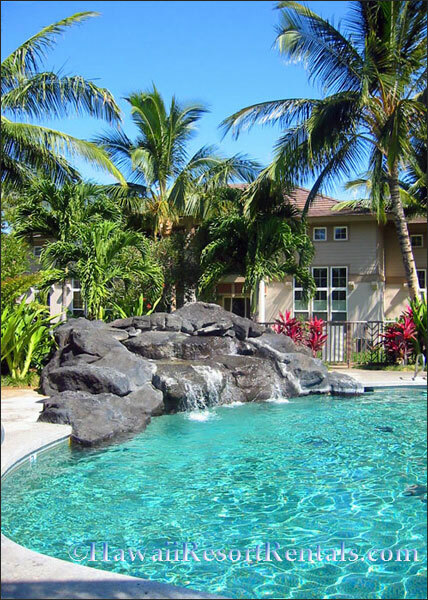 This 2 bedroom, 2 1/2 bath vacation rental also frames vistas of the palm-ringed pool and Kohala Mts. 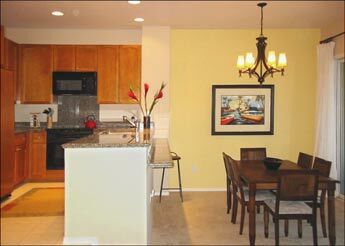 It is next to a large pool and spa, gas BBQs, gym and across from the tennis court. Groups may also rent our nearby Hale Pele with a golf discount. 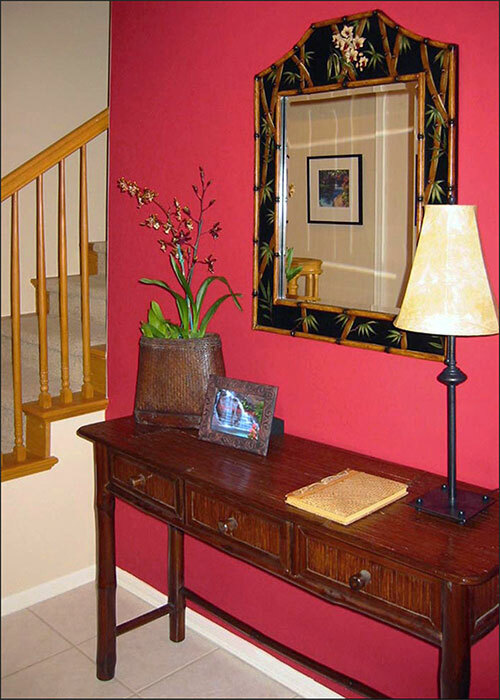 Furnished in an island flavor with warm inviting colors, this townhouse features original artwork and quality furniture creating a beautiful environment. The two-story living room with soaring windows has an airy, relaxing feel. 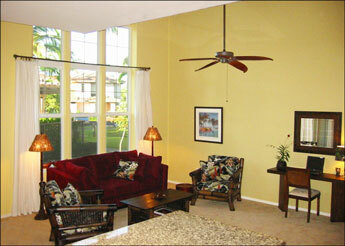 On balmy 75° days let ceiling fans and sea breezes stir the air or use air-conditioning. The living room and bedrooms have ceiling fans and TVs. Use secure wifi or enjoy movies, CDs and games for all ages. Grill fresh fish and enjoy farmers market finds in the well-equipped kitchen. Or if simply brewing a cup Kona coffee is your idea of vacation cooking, you'll find world-class dining nearby. Unwind to the waterfall's peaceful splashing. 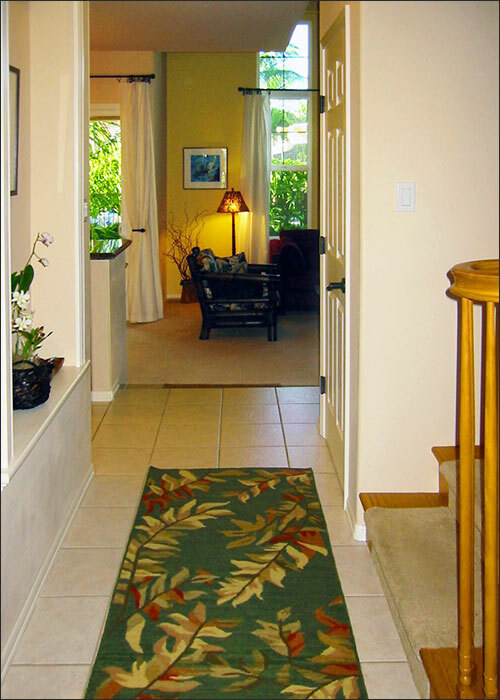 Hale Wailele has two bedrooms, two baths upstairs and a half bath downstairs. 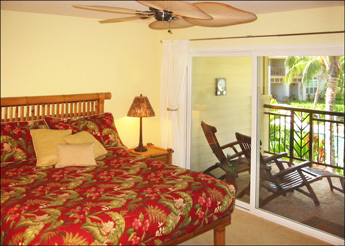 The master suite has gorgeous views, a lanai and handsome bamboo furniture with a king bed. 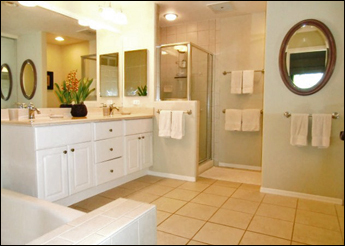 The spacious master bath features marble counters, a soaking tub and separate shower. The tiled second bath has a marble counter and a shower over tub. A second charming bedroom has a king or twins. Vistas are swaying palms, lava and golf greens. The queen-width sofa bed in the living room is great for kids. To make your visit carefree we offer washer/dryer, garage with opener, dishwasher, microwave, phone, answering machine, wifi, 3 cable TVs, CD & DVD/VCR player, CDs, movies, coffee maker & grinder, juicer, toaster, blender, ricer, popcorn popper, spices, iron, ironing board, linens, beach towels, clock radio, hair dryers, toiletries, games, books, cooler, boogie boards, beach toys, beach umbrella & chairs, tennis & snorkel gear. BBQs by pools. 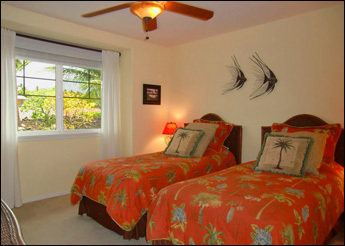 Also see a slideshow of our private 2 bedroom, 2 bath villa overlooking the 10th fairway with discounted $50 - $75 golf, Hale Pele. Hale Wailele is an affiliate, under different ownership.